Although the E Ink Pearl display used by Kindle and Nook devices provides an excellent contrast ratio and power consumption, it doesn't have any integrated backlighting, making it difficult or impossible to view content in dark environments. Reading the Kindle 4 or Nook Simple Touch before bed requires a lamp or some other light source, such as one of the various LED attachments sold as accessories. Rumors have been swirling about a new Kindle design that solves this problem, but Barnes & Noble has beaten Amazon to the punch, unveiling an updated version of its second-gen e-reader. 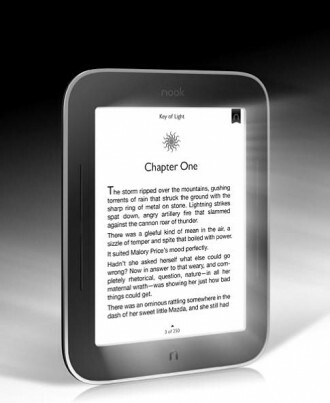 Called the "Nook Simple Touch with GlowLight," the device uses a "patent pending" technology that places LEDs along the e-reader's bezel. This is accompanied by an anti-glare surface that helps provide uniform lighting. GlowLight can be enabled or disabled by pressing the "N" button for a couple seconds and its brightness can be adjusted with an on-screen control. By using the light, the Nook Simple Touch's battery life is halved to one month of charge (reading 30 minutes a day), but you can expect the same two-month lifespan when reading with the LEDs off. The reduced autonomy should still be plenty for most users. According to hands-on impressions by PCWorld and The Verge, the illumination is very even across the display. Although there is a thin strip of bright light along the bezel's edge, neither outfit says it's bothersome. Preorders are open for $139 with free shipping and units purchased today will arrive in early May before Mother's Day. The original Nook Simple Touch will remain available at its competitive $99 price point. That might seem like a hefty premium for the GlowLight model, but it's about what you'd pay for a separate anti-glare film and LED add-on. And for whatever it's worth, the new unit is about half an ounce lighter.